Picks up conversations or other desired sounds with extra clarity and definition. 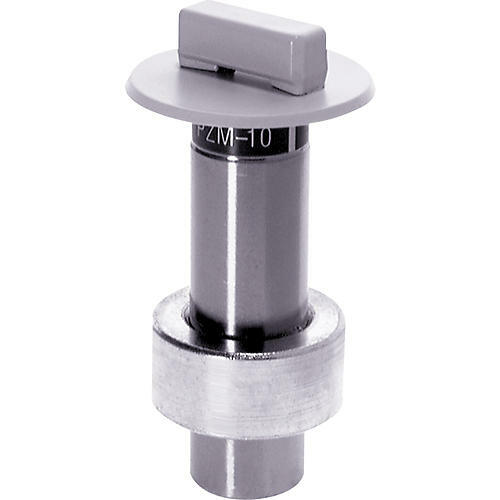 The CROWN PZM-10 uses a miniature mic capsule mounted close to a sound-reflecting plate or boundary, in the pressure zone. In this zone, direct sound from the sound source combines in phase at all frequencies with reflected sound off the boundary. The benefits are many: 6 dB more sensitivity, 6 dB less noise, a wide smooth frequency response free of phase interference, excellent clarity and "reach", and consistent pickup anywhere around the mic. Frequencies below the voice range are rolled off to reduce pickup of air conditioning rumble. The high-frequency response is boosted slightly to help articulation. The CROWN PZM-10 is a part of the Pressure Zone Microphone line, and is designed for security, surveillance, and conference-table use. Since they do not look like microphones, they are inconspicuous. The PZM-10 has a tubular housing that easily mounts in a 25/32-inch diameter hole in a ceiling panel, wall or table. It has a mic-level output and a 3-pin XLR-type connector for easy plug-in installation and requires 12 to 48Vphantom power. Get a boundary mic with high fidelity and low visability. Finish: Off-white. May be painted any color.